The following is a partial summary of the conclusions from the fxempire.com weekly analysts’ meeting in which we share thoughts about lessons we’ve learned for the coming week. The focus is on global stock indexes as these are the best barometer of overall risk appetite and what drives it, and thus of what’s moving forex, commodities, and bond markets. The Fed scored a victory Wednesday with its beginning the taper of its QE program. 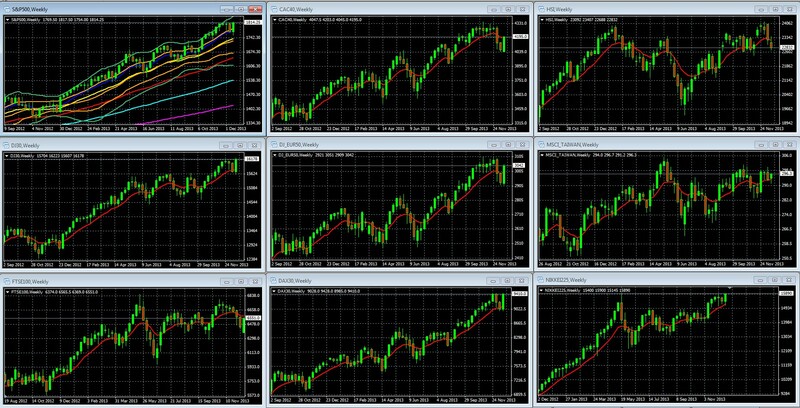 Not only did it manage to avoid causing a market selloff, it caused virtually all major indexes to rally on the news. See here for details, lessons, and how to profit. In the days before the FOMC meeting, US and major international stock indexes were overall higher, reflecting a consensus view that the Fed would not begin tapering (there were no other big competing stories from Monday through Wednesday, so market movements were largely a reflection of taper sentiment). However the behavior of forex and bond markets’ saw a greater chance of the Fed announcing the start of the taper. The USD traded in a tight range reflecting no clear consensus, as did the benchmark US 10 year notes. The lesson is that here is another example of how currency and credit markets tend to anticipate better than those of equities, so they are worth watching. Learning how to read and interpret price movements in a variety of markets will make you a better trader and investor, because you’ll pick up hints that those who focus solely on one kind of asset or market will miss. See here for more on the basics of inter-market analysis. The fact that the Fed’s taper was only symbolic was bullish for stocks and other risk assets, because a substantive taper would have hurt growth. The fact that the EU’s new bank reform and backstop plan was only symbolic was bearish, because the EU desperately needed a substantive plan. Indeed, this failure might ultimately prove to be the biggest event of 2013. So the good news is that the EU is making some progress, albeit just a symbolic first step, to end the risk of insolvency spreading from one small bank to an entire banking system, nation, or even the EU. The bad news is that the EU desperately needed real substantive progress and the current deal has actually made the EU more vulnerable than ever to having even just one bank default metastasize into a full blown EU banking crisis yet again. For example, thanks to the official enshrinement of private deposits, investor and lender bail-ins, the EU has now introduced the added risk of pre-emptive bank runs and capital flights causing crises that might otherwise have not happened at all. We wrote in detail about this, so rather than repeat ourselves; see here for our full special report on how it failed, and the very significant ramifications. On Monday we saw more of the usual story, modest improvement in the overall EU PMI data but most of that due toGermany, while French data continues to show economy weakening. On Tuesday core EU CPI came in lower than expected, feeding deflation fears. It’s taken three months of negotiations since Germany’s general election, but finally Germany has a new government after the left-leaning Social Democrats (SPD) overwhelmingly voted to join its ideological opposite (hence the long negotiations) Chancellor Angela Merkel’s conservatives in a grand coalition. The big ramification and lesson for the coming week and beyond is that Germany is now able to sign on to the pending EU banking reform deals, which have been seriously weakened modified to make them acceptable to Germany. Continued spiking interest rates: This was the big cause of the drop in Chinese indexes, both in Shanghai and Hong Kong, as both dropped for the second straight week amid increasing fears of another cash crunch in the short-term money markets. The 7-day repurchase rate spiked 100 bps to a six-month high of 7.6%, a jump of 328 bps this week. Borrowing remained expensive despite the People’s Bank of China making an emergency cash injection in the financial system after being inactive for over two weeks. An unexpected slowdown in manufacturing per the HSBC survey that emphasizes smaller, private firms as opposed to the official mfg PMI that focuses on larger state owned firms. The technical picture for our representative sample below of leading US and international global stock indexes, and thus of risk appetite, is unchanged from last week. The index remains firmly within its double Bollinger band buy zone, indicating that we can still trust this uptrend to continue. See our article, 4 RULES FOR USING THE MOST USEFUL TECHNICAL INDICATOR, DOUBLE BOLLINGER BANDS, for an explanation of how to interpret this very useful indicator. As noted above and in other posts over the past 24 hours, dovish fed policy and improving jobs, GDP and spending data support the uptrend, which has been able to move upwards with nothing but QE to support it for much of the past 24 months. Now fundamentals are becoming encouraging too. All EMAs trending higher, with shorter durations above longer duration EMAs, suggesting continued momentum. European stock index uptrends remain intact but, except for Germany, are showing real signs of weakening, as they’re struggling to hold or regain long term support levels of their 10 week EMAs.